What Do You Want To Know About The 2018 Ford Mustang? I’m going to Malibu, California, on Monday to drive the updated 2018 Ford Mustang. And while I’m plenty curious about it myself, I really want to know what you, our dear readers, want to know about it. Send me some questions! I’ll do my best to answer them while I’m there! The 2018 model is not an all-new model, but a big update. It sounds pretty badass. 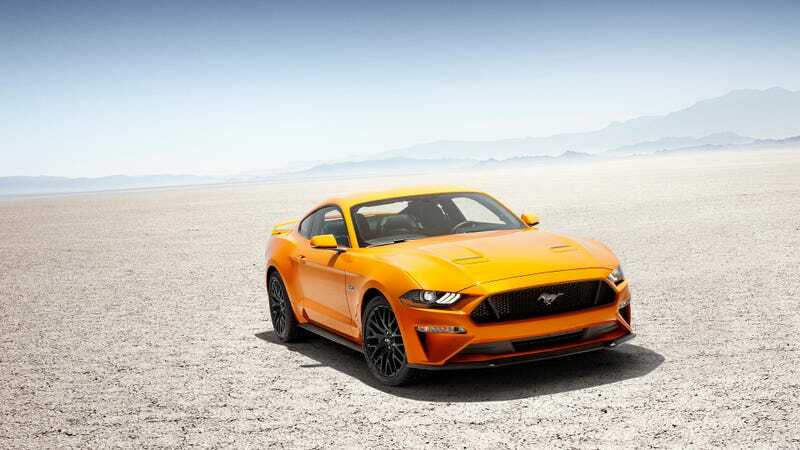 Power for the V8 GT is up to 460 horses, every V8 model can go from zero to 60 in less than four seconds, there are some cool new Performance Pack options, and the cheapest of the V8s starts at just $35,095. In other words, or reachable for schlubs like you and me. There’s also an all-new 10-speed automatic transmission. I’ll also likely be driving the EcoBoost four-cylinder Mustang, now boasting 310 HP and 350 lb-ft of torque. The four-banger also gets the 10-speed and Drag Strip Mode, and can sprint to 60 mph in under five seconds. Remember when base model Mustangs were kind of bad? Definitely not the case anymore. I’ll also be in and out of the 2018 Ford Expedition, so feel free to send me questions on that beast as well. I have never driven an Expedition before. You cannot imagine how thrilled I am. It should be a good time! Let me know what you want to know in the comments.